Wherein Mel writes not only of her first experience with a professional editor, but also updates on her other writerly endeavours. A lot of other writing blogs cover this. Off the top of my head, I can think of posts by Kristine Katherine Rusch, Joanna Penn, and K.M. Weiland that have all dealt with this topic with much more aplomb and professionalism than I. As ever, I write from my experience. I only hope that my experience speaks to you, and that it might save you any errors I might make. My history with editors has not been wonderful. Early experiences taught me that teachers rewrite your work without permission; that apparent friends will destroy your work out of spite; that lazy editors will use technology as an excuse to publish your story with errors that didn’t exist in the clean copy you provided them; and that advisors who don’t relate to your creative choices will tear you down rather than admit they can’t help you and refer you to someone who can. All of these lessons have made me afraid to show my work to anyone because they have informed my inner editor, that psychological construct that internalizes any negative experience and tricks you into believing the worst about yourself and your work. I’ve worked long and hard to overcome my internal editor, but exposing my writing to the eyes of others still turns like a knife in my gut. My first, instinctual reaction is to take every criticism to heart and therefore reject it out of hand as a result. 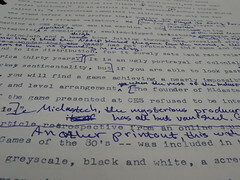 critical distance from your work that you need to self-edit effectively. When you’ve gone as far as you can on your own, it’s time for a professional. Yes, a professional, one who offers her or his services for a fee, can be expensive, but this is an investment in your work. If you are willing to invest in writing conferences; if you are willing to invest in writing courses and workshops; if you are a member of more than one professional writers association; or if you are willing to invest in self-publication, then you should be willing to lay out some cash to make sure your work in progress is the absolute best product it can be. Some would argue that beta-readers can be an effective replacement for the professional editor. That depends on whether your betas have the skill and acumen to offer you a professional-level critique. A note on beta-readers: For those of you who don’t know what a beta-reader is, the term derives from the online gaming and programming world. As a computer game is preparing for release, the developers (analogous to writers) release the game to a restricted group of game testers. Essentially, these are people from their target audience and they share with this select group the full game-play experience in order to obtain information on remaining system bugs and other issues that will affect the experience of the general gaming public after release. In this sense, a beta-reader should be someone who enjoys the kind of novel that you write. She or he should be a part of your target audience and while the primary goal is to point out flaws that may detract from the experience of your general reader public, their feedback may stop there. I would argue that it should. Once again, more astute minds than mine have addressed the topic on their blogs. Just Google beta-reader and you’ll no doubt get a plethora of results and perspectives on the topic. Some will advise you to use your fellow writers as beta-readers. Others will tell you to restrict to well-read friends. Here’s what I know: A critique group is a very different beast to a beta-reading group. A critique group is more along the lines of fellow writers who will get into the nitty-gritty of your text, point out grammar and spelling errors, as well as plot and structure issues. A critique group will also be diverse and the critiques you receive will often differ, if not contradict each other outright. The thing you have to watch with a critique group is that they are your peers and often at the same or similar points in their careers to yourself. You want that critique, and trust me, you need it, but a critique group is not a substitute for a professional editor. My advice is to work with a critique group earlier on in your process, after your first of second draft but before you seek the help of a professional editor. Beta-readers, on the other hand, serve their best purpose after the professional edit, as you’re putting your final polish on your product for publication. They’re a test audience, a focus group, if you will. 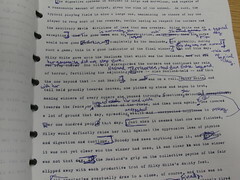 What I would recommend: Write, revise at least once on your own, work with a critique group and revise at least once more based on their feedback, seek professional feedback, revise based on that, then finally send your manuscript out to beta-readers, and put the final polish on your work prior to seeking representation, publication, or self-publishing. If you go the traditional route, this may not be the end of your editing and revision. Get used to receiving, assessing, and incorporating critique now so that you can respond professionally later. After choosing my editor, I reviewed her web page and followed her directions for contact. I enquired if she had the time in her schedule in January 2013. When she replied that she did, I asked further detail. In what format did she want the manuscript (ms), and in what file format (.doc, .rtf, .pdf). I also asked how long it might be until I heard from her, because I didn’t want to be waiting anxiously, or bothering her needlessly. All that established, when the time came, I sent her a preparatory email (are we still good to go?) and then the ms. While I waited for her response, I took on some other projects. Despite the nay-saying of my inner editor, I was doing the happy dance 🙂 We scheduled our conference call for Saturday (yesterday) and I was sent the reviewed document along with a couple of other documents outlining more general concerns on Friday. I read the documents through quickly, because I wanted to be well-versed in the content of the edit while at the same time staving off that crazy instinct of mine to take everything to heart and get defensive. Then I set everything aside until our scheduled conference. I have to confess that I wasn’t entirely successful in remaining receptive throughout the call, but my editor made it easier for me by being kind and encouraging. This is not to say that she blew smoke up my skirt 🙂 Far from it. I have more work ahead of me, but in being honest about the relative value of my work and encouraging me to stay the course, my editor gave me the opportunity to set some of my defensiveness aside and ask some serious questions about where I needed to focus my efforts. It was a good experience and well worth the fee. That said, I’m going to let the project incubate for a while again. I now know where I need to go with it, and I have some ideas about how to get there. I’m having more ideas all the time 🙂 I do feel the urgency to return to Initiate of Stone, and that, more than anything else, tells me that I will return to it with passion when the time comes. I also put my name in to participate in Kasie Whitner’s “Just Write: 2013 Short Story Challenge.” The goal here is to write one new short story per month. As I hope to do that anyway, I think I can manage it. My January story was flash fiction created for one of Chuck Wendig’s flash fiction challenges. February’s is well underway (8 pp/2500 words so far). Also in January, I revised and submitted a short story to On Spec. As planned, I have returned to work with my online critique group. I’ve also started working on a new novel. Gerod and the Lions is about a young boy who sets out to save his little sister Annabelle from the child merchants after his pa sells her to feed their poor family. This will be a middle grade (MG) fantasy and so the finished work should be about 40,000 words. I have my outline and two chapters written (10 pp/3000 words). As you can tell by my relative output, I’m a slow writer. It comes from working a day job, I think 😀 Writing in the evenings and on weekends puts a limit on what I can do in any given week. Plus, I write for Writerly Goodness and journal. I’m going to finish my February short story and continue working on Gerod for a while. I also want to submit another short story to Tesseracts 17. I’ll likely get back to IoS before the end of February, but I want to make sure I have enough of Gerod done to feel that I can return to the project without having to start from scratch again. In the next week or two, I will have a lovely interview with Lara Schiffbauer regarding her upcoming novel, Finding Meara. I’m also going to be taking a bit of a morbid turn with a short series in death and how it’s shaped my life. There will be another Pupdate when Nuala has her next check up, and a report on how my next training gig (and journey toward certification) goes. As ever, it’s a mixed bag at Writerly Goodness. Thanks for stopping by and commenting, Erin. Glad the post resonated. So glad that your “first editor experience” was a positive one and left you with clear indications of what still needs to be done. Thanks, Irene. First official, professional editor experience, that is 🙂 Things are definitely looking up. Thanks for sharing your experience with the editing process! I liked how you differentiated between a critique group and beta-readers. I’m so glad that you found an editor who was encouraging while also giving you something to think about! Good luck with your future writing plans! Good to see you on WG, Jennifer. Glad you enjoyed the post. Critique and beta-readers (and editors, for that matter) all serve different purposes (IMO) and they all have their places in the process. This experience helped me clarify some of my muddled thinking on the matter. Thanks, Vikki! Following your Faber advertures with fervour 🙂 How’s that for alliteration? LOLZ! And thank you for stopping by to comment, Gemma 🙂 Good to know you found this useful. Will be looking forward to finding out how your experience goes. Break a pencil (superstitious writer’s good luck)! Melanie, thanks for sharing your experience. It’s so meaningful to hear both the pitfalls and successes of what another writer went through in working with editors. Good luck as your manuscript moves forward! Thanks, Elissa. Every step is one closer to publication. It’s all process and all organic. I follow my intuition and learn as I go. Fortunately, I chose my editor wisely.